Workouts for couples might not sound like an effective way get a good sweat in, but in fact, they are a great option. If you ever feel like you have to choose between prioritizing your fitness and spending time with the people you love, consider this win-win scenario! Workouts for couples benefit both sides! Working out as a couple increases intimacy and strengthens your bond, giving you the opportunity to support and rely on each other in new ways. Plus, the encouragement from your partner can push you to new levels of fitness, not to mention make exercise a lot more fun. You don’t have to be at the same fitness level! Just driving to the gym together — even if you split up when you get there — boosts the accountability factor and shows your partner you’re committed to both of your fitness goals. Of course, you don’t need a gym membership to reap the benefits of joint exercises. There are plenty of workouts for couples to do together at home (or anywhere), whether you’re running, biking, doing sit-ups or push-ups. One person holds the bottom of the squat position while the other does jump squats (or regular squats) for 10-20 seconds, then switch. Stand arms’ length apart, facing each other. Step into a forward lunge as your partner steps backward into a lunge. Alternate for 2 sets of 20 reps. Sit facing each other with your knees slightly bent and your heels planted firmly on the floor. Lean back on your tailbone, keeping your back straight. Pick up a weight or medicine ball and move it back and forth, touching the ground on either side of your hips for 10 reps while your partner holds the position, then switch. Sit opposite each other with legs locked and take turns doing sit-ups, either slapping hands in the middle or passing a weight or medicine ball back and forth for 30 reps. Assume the push-up position, then have your partner lift your legs by the ankles and hold them while in the bottom-of-the-squat position as you do 10 push-ups. Switch. Have your partner hold a plank position while you jump from side to side over him or her 10 times, then switch. Face each other in the plank position with your arms straight (like the top of a pushup). From here you can alternate hand-slaps, or take turns doing 10 pushups while the other holds a steady plank. From standing, touch your chest to the floor, then pop up onto your feet and jump with your hands overhead. Then your partner’s turn. Do 30 reps each. Stand facing each other on either side of a sturdy box or step. Take turns stepping up onto and off of the box for 30 reps. For a challenge, jump on the box with both feet, then step down. Lie flat on your back with your arms at your sides with your legs straight up in an L position, then allow them to fall open into a V shape. Try to pull your feet back together as your partner provides resistance by pushing your legs down toward the floor for 20 reps, then switch. Stand back-to-back and sink down into a wall-sit position, using each other for balance. Hold as long as you can. 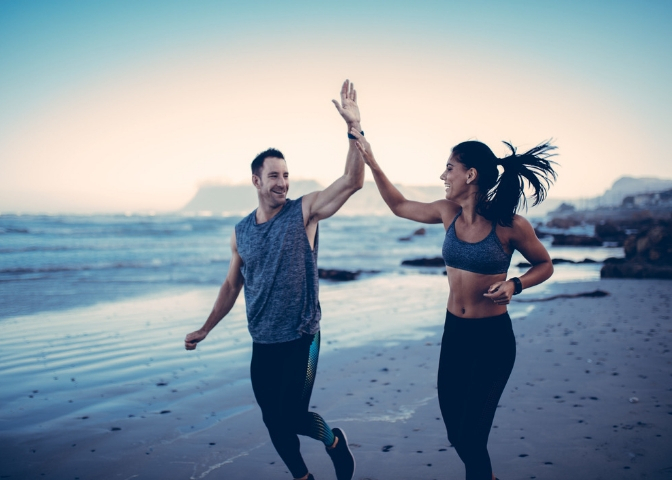 If you want to optimize your couple workouts, make sure both you and your soul mate fuel up with THRIVEFIT to help increase lean muscle mass and facilitate a faster recovery. And have fun!